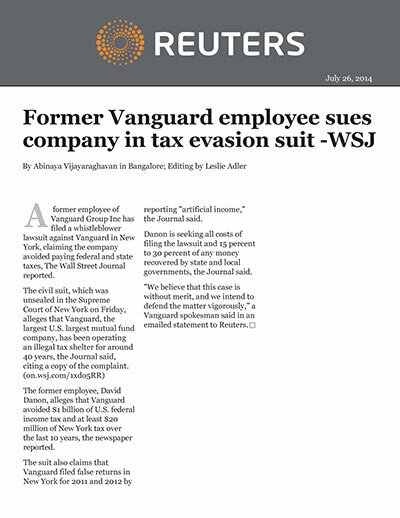 A former employee of Vanguard Group Inc has filed a whistleblower lawsuit against Vanguard in New York, claiming the company avoided paying federal and state taxes, The Wall Street Journal reported. The former employee, David Danon, alleges that Vanguard avoided $1 billion of U.S. federal income tax and at least $20 million of New York tax over the last 10 years, the newspaper reported. The suit also claims that Vanguard filed false returns in New York for 2011 and 2012 by reporting "artificial income," the Journal said. Danon is seeking all costs of filing the lawsuit and 15 percent to 30 percent of any money recovered by state and local governments, the Journal said. "We believe that this case is without merit, and we intend to defend the matter vigorously," a Vanguard spokesman said in a emailed statement to Reuters.